Home > Blog > Global Tree Cover Loss Remains High. Emerging Patterns Reveal Shifting Contributors. For 2015, the data reveal both positive stories—such as a possible slowing of tree cover loss in Colombia—and more worrisome trends, including rising rates of tree cover loss in Papua New Guinea, West Africa, and the Mekong Region. We explore those stories below, as well as what the data can tell us about global state of forests. 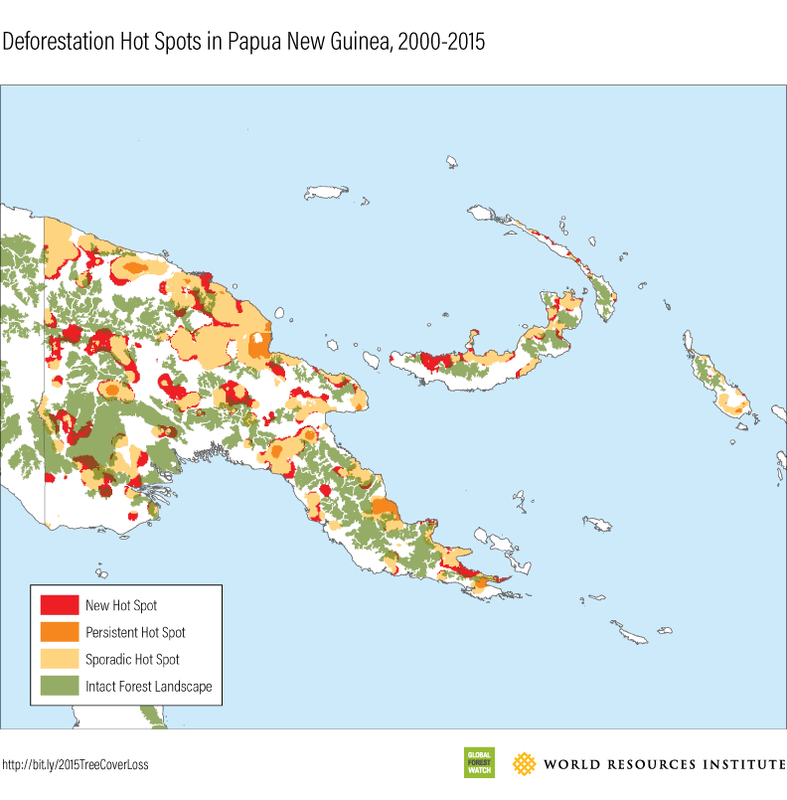 Papua New Guinea experienced 70 percent more tree cover loss in 2015 than any year on record. Oil palm expansion also likely contributed to the dramatic increase in tree cover loss in West Africa. In 2015, Liberia and Sierra Leone respectively experienced a 6- and 12-fold increase in tree cover loss rates compared to 2001. According to reports, West Africa is at high risk for deforestation from palm oil, with Liberia set to become a new frontier for development of the crop. Some of the rise in tree cover loss in this region could be due to changes in the algorithm that detects clearing. An update to the tree cover loss methodology in 2013 improved the way the algorithm detects clearing of tall shrubs resulting in more detection of tree cover loss in dry forests in particular. Future data updates should confirm whether this is a true uptick in loss, or due to these methodological changes. Colombia's tree cover loss rate has dropped nearly 50 percent since its peak in 2007. National government statistics confirm this trend, indicating that the deforestation rate from 2010 to 2015 was nearly half that of 2000 to 2010. There is no consensus on why loss has slowed, though the Colombian government's commitment to zero net deforestation in the Amazon by 2020 could be a factor. 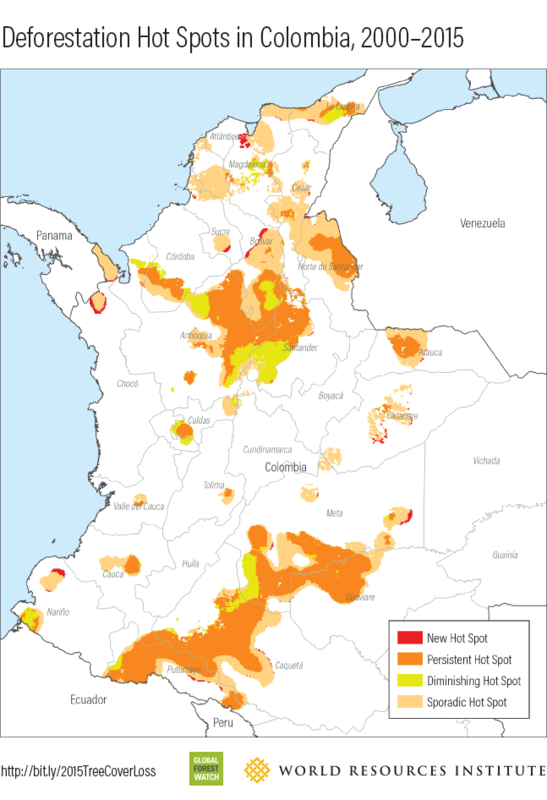 Hot spot analysis shows a significant drop in tree cover loss in the mountainous areas in Medellin and the departments (states) of Caquetá and Guaviare between the Andes and the Amazon. Major climate financing and international funds granted to Caquetá and Guaviare may be playing a role in the decline. However, recent shifts in political dynamics could make this decline short-lived. FARC, Colombia's largest rebel group, has indirectly reduced deforestation in the Colombian Amazon over decades by warding off outsiders with their presence. Under a new peace deal, FARC units are set to withdraw from their posts within the forest, which could make those areas more vulnerable to agricultural expansion, illegal logging and illegal mining. Mekong Basin countries are experiencing rising tree cover loss rates, especially Myanmar, Laos and Thailand. Clearing for plantations, agriculture, logging and infrastructure development are to blame for much of the loss. Only 6 percent of the 2015 tree cover loss in Cambodia occurred in existing plantations, meaning the other 94 percent (124,518 hectares or 307,690 acres) is likely loss of natural forest and not harvesting of planted trees. 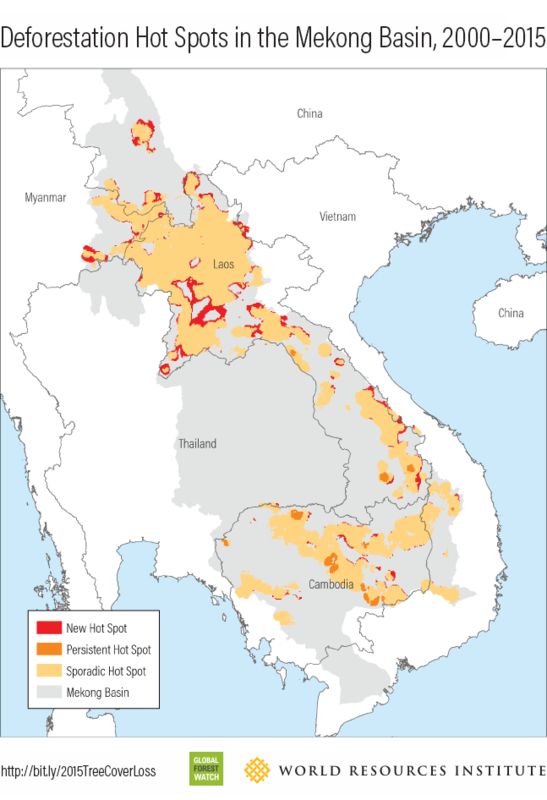 Hot spots analysis in the Mekong Basin shows new hot spots in northern Laos that could be associated deforestation from recent dam infrastructure development along the Mekong River, while hot spots south of the basin suggest plantation development is the main driver. 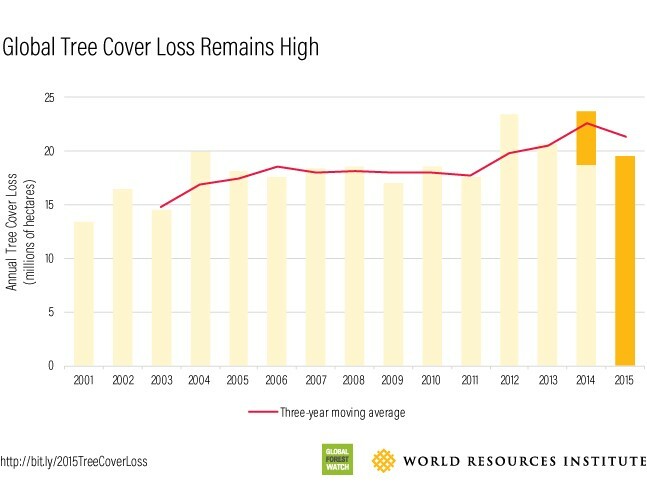 Global tree cover loss remained high in 2015. That year, the world lost nearly 20 million hectares (49 million acres) of tree cover, an area the size of Uganda. 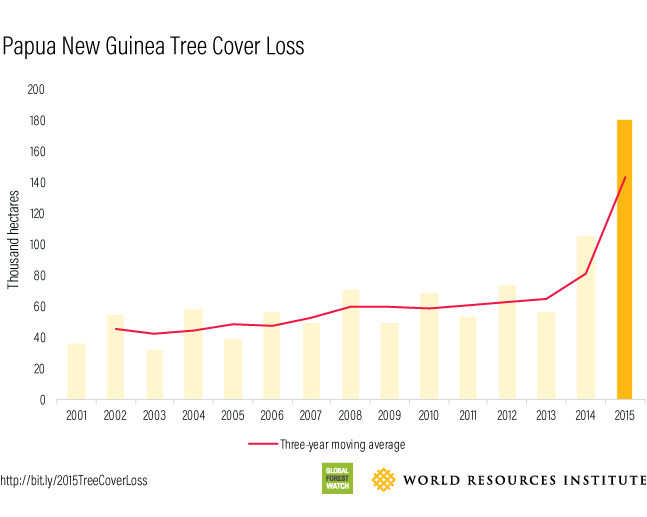 Though the current estimate for 2015 tree cover loss is lower than that of 2014, the overall trend of global tree cover loss (defined as a three-year moving average indicated by the red line in the chart below) reached the second-highest point on record in 2015. The world also lost 47 percent more tree cover in 2015 than in 2001. As part of the ongoing effort to refine and improve the accuracy of the data, the update also recalculated previous years' tree cover loss using newly available satellite images and picked up an additional 5 million hectares of loss (12 million acres) in 2014 (read this post to understand why and how data can be revised from year-to-year). While the new data paint a clear picture of tree cover loss hot spots across the tropics, the status of boreal and temperate forests is less definitive. The 2015 data show Canada, Russia and the United States as the top three contributors to global tree cover loss (they are also the countries with the greatest amount of forest). However, without information on timber harvesting and tree cover gain (caused by reforestation or natural regeneration), it is difficult to say how much forest is actually lost in these countries. We anticipate annual tree cover gain data will be available in 2018, which will allow us to more accurately monitor forest change in these countries. Although one year does not make a trend, annual updates provide insight into patterns of tree cover loss over time. Additionally, near real-time data like GLAD alerts and active fire alerts as well as analysis tools like emerging hot spots can help us gather more information about when, where and why losses occur while there's still time to stop further damage. Visit Global Forest Watch to keep an eye on how tree cover changes in the regions spotlighted above.